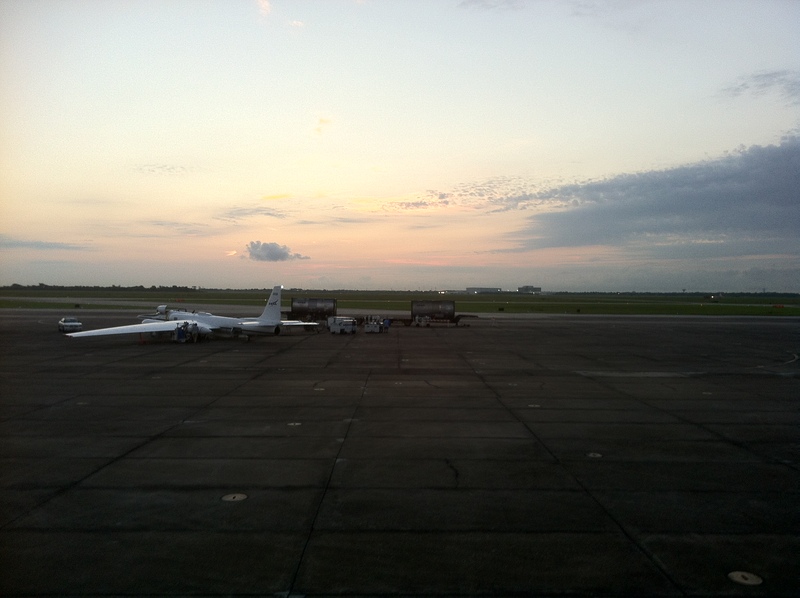 This post was provided by Tristan Hall, a student from Florida State University on the Studies of Emissions and Atmospheric Composition, Clouds and Climate Coupling by Regional Surveys (SEAC4RS) airborne science mission. First off, sorry for not writing. I will make no excuses. Secondly, I got to fly in the DC-8! 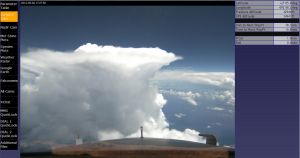 On a convection flight! The goal of the flight was to investigate marine convection in various stages: growth, mature, and dissipative. The mature is the best! Down at the far end of the base is the entrance to the hanger that houses all the science equipment. It was a bright crisp morning (crisp… HA! it was probably 80 F at 5 AM! ), and I’m grateful to Nick for waking up slightly earlier than usual so he could drop me off. There was a safety briefing before we got on the plane for us newbies. It’s basically like the one you see on a commercial flight. However, there is a little addition in case of a gas leak on the plane. In case of this, there is a little hood that pops on over your head and constricts around your neck to protect you. After the video, there was the flight brief that basically just went over the science objective. Interesting note that they like to put in there: the plane had 126,000+ pounds of fuel! Post pre-flight brief I got to wander around for a few. This was fantastic! I got to walk up to the DC-8 and ER-2. RIGHT UP TO THEM! I could’ve touched the turbines if I wanted! There was a beautiful sunrise, and everything. Thank you nature for being you. 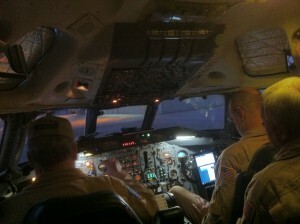 I was advised by Hal Maring to ride in the “jump seat”. Well… let me tell you… WOW. This seat is located in the cockpit. It sits a little higher than the captain’s seat, and you can see everything! I got to see takeoff and landing! One of the greatest experiences of my life. Seeing the three pilots (pilots? Two pilots and an flight engineer who controlled the power board) work together on takeoff; the giant checklists they had to go through; and the coordination with ATC was just impressive. I got to listen in on the headset to the pilots talk to each other and ATC. A funny joke of the morning was when a NASA jet took off with its afterburners, someone on the radio said that they “better see the DC-8 do that”. I wish! Whenever you think your plane is taking too long to depart the gate, I’d like you to think and understand the complexity of a plane. The amount of safety checks is phenomenal. The flight engineer gave me my brief. He pointed out my oxygen mask, and the pilot quickly turned around to show which one was his, and to not take it. The oxygen masks were the type you see the fighter pilots wearing – not the plastic bag that “may not inflate”. In case we were to ditch, I had to wait for someone from mission control to get me, or if it was quite bad, the pilots were to yell at me to get out, and they “wouldn’t be nice about it”. Understandable. I tried as best I could to catch on to the lingo amongst the pilots and ATC, and boy was it interesting! NASA817 Heavy. That was the phrase I listened for. On the ATC channel multiple planes are talking so it can get confusing pretty quickly, but all I listened for was NASA817 Heavy. The “heavy” stands for (and I just Googled this, so naturally it’s true) when a plane is heavier than 300,000 pounds. How about that! On our ascent to altitude, a plane was in the region. “NASA817 Heavy, you’ve got traffic on your 11 o’clock”. Okay so, you know scenes in shows when planes crash in mid-air? I totally see that as plausible. After ATC said this, all three crew members stopped what they were doing and stared out the window. I did this, as well. I mean, I was basically flying the plane – these guys were depending on me. We kept looking… and looking… and looking until this plane comes zooming by. It looked like it was a mile away. Travelling at 300 mph, it doesn’t take long to get next to each other. As soon as the plane was in sight, it was out of sight. Thank an air traffic controller. The dance that the flight crew went through was impressive. The pilot was basically not to be bothered, ever, I gathered. He flew. If the co-pilot was doing something (turning a knob, or piloty things), and the pilot needed to do something that was in the way, the co-pilot immediately removed his hands and stopped what he was doing so the pilot could finish his task. This happened when the pilot just wanted to increase the thrust. Just something as simple as that, and all hands were out of the way. Amazing stuff. The flight itself was great, too. We were following storms, what else is better?! For ease of communication, the storms were named. One of the commanders on mission control on the plane was Hawaiian. He named one of the main storms we studied Leilani (heavenly lei; beautiful, eh?). This beauty was fun. We got into the updraft of the storm which maxed out around 10 m/s (22 mph; that’s pretty good) followed by a 7 m/s (16 mph) downdraft. I got to feel weightless for a good second or two. WOO! Let’s just say, I’ll never be troubled by turbulence on a commercial flight, anymore. Mid-flight we got to spiral down to the boundary layer (near surface layer). 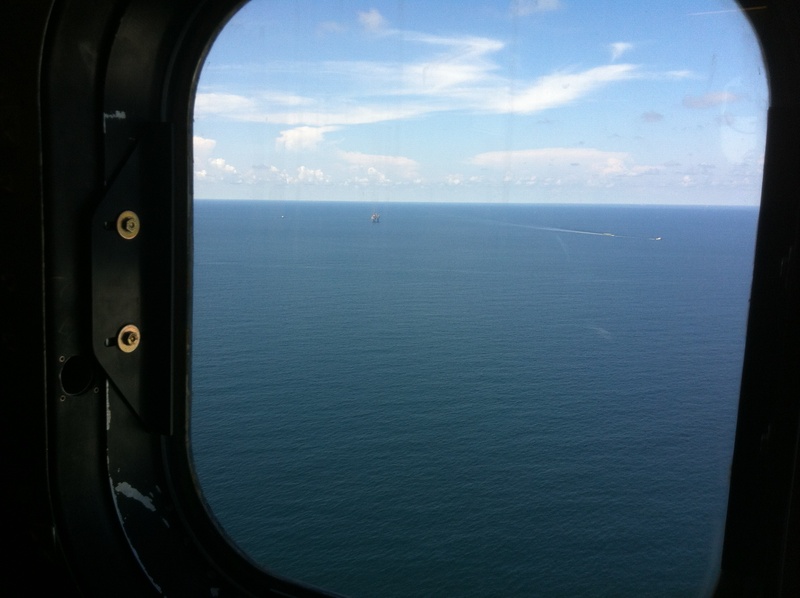 As we spiraled down… and down… and down… the oil rigs kept on getting bigger… and bigger… and bigger. Then we straightened out and flew at 350 ft. Yea… 350 FEET! From the OCEAN SURFACE! AT 300 mph! The oil rigs were zooming by. We finished a successful mission, and returned to Ellington. 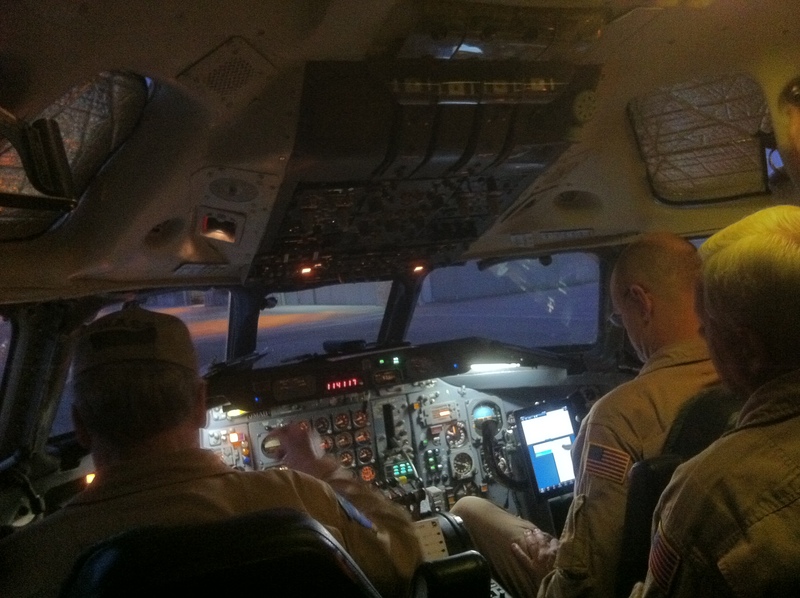 Landing was just as amazing as takeoff in the jump seat. The pilots kept asking me for hints on landing, and I was all like “guys… it’s your turn, you’ve got this”. The best I can compare that too is a simulator on your computer or something. Once the runway is in view it just keeps getting bigger and bigger, until the bump of landing. The end to a wonderful day. Overall, this was just an amazing experience. It was truly breathtaking and inspiring. 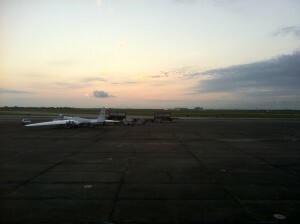 The NASA Airborne Science program is unique. I hope to be a part of it for the years to come. There is so much imagination, and pure brilliance that goes into the science equipment onboard the plane. In case you are wondering, the plane is outfitted such that basically every-other window is removed and replaced with an instrument. So there are around 30 instruments sticking their little noses outside the plane. The engineers need to be very creative to design their apparatus so that it conforms to the plane. Speaking of the plane, there were first class seats, and Bose noise-cancelling headphones! Oh yea, top notch. These are essential as the plane is LOUD without the headset, and everybody needs to talk on the mission channel. The first class seats are must as who the heck wants to sit in a tiny seat for 8 hours, and not be able to move?! I will forever remember this experience.